A-MUSINGS » Blog Archive » What’s With No Shave November? What’s With No Shave November? Posted on November 28, 2011, 10:57 PM, by dkillo, under General. This month, I noticed an exponential increase in scruffiness among my male friends. The movement apparently started in Australia to raise awareness for men’s health issues, such as prostate cancer. Named Movember (“mo” for moustache), the event dictated that men would start with a clean-shaven face on November 1st, then cultivate the best-groomed moustache they could muster (no goatees, sideburns or beards allowed) by the 30th. It seems that American college boys have kicked this up a notch (or down, depending on one’s perspective) by growing whatever beard or moustache they can without regard to grooming, and the month has since been dubbed “No Shave November.” Sadly, it seems the cause-related aspect of the experience has been lost, and the event has deteriorated into a scraggly, facial free-for-all. Are these young men just looking for permission to be sloppy or lazy? And what about the ladies? Are they going “no shave” as well? What’s next? No bathing December? If we’re going to give ourselves permission to be unkempt, I would much rather go broader. How about No Housecleaning November? No Raking Leaves November? Or even No Laundry November? And why limit ourselves to the eleventh month. Let’s spread this out. How about No Shoveling Sidewalks December (for our friends in the north)? No Resolutions January? And my personal favorite, No Income Tax April! Maybe, if we pause momentarily from the stubbly frivolity, we can compile a list of No-s that can actually be helpful year-round. No Ingratitude November – Especially during the month of Thanksgiving, we should make every attempt to be grateful for the blessings that we do have. Sometimes our personal troubles or business stresses cloud our vision, and it’s hard to be in a thankful mood every day. But remember that there are always those less fortunate than we are, and we should appreciate the blessings that we do have. No Worrying November – This one is personally hard for me. I’m genetically predisposed to worry, but I’m making a conscious effort to not obsess on what might happen and to try to be more of a warrior than a worrier. No Impatience November – Our patience is tasked every day, especially this time of year when people are rushing about preparing for the holidays. The lines at the stores may not move fast enough for you. Grid locked traffic delays your trip home. Take a deep breath and get centered. Look at your options. Can you shop online instead of in a store? Can you take a side street home? And if there’s nothing you can do, then there’s no sense wasting your valuable energy getting angry. So this month, and every month, just say “no” to negative thoughts and actions. 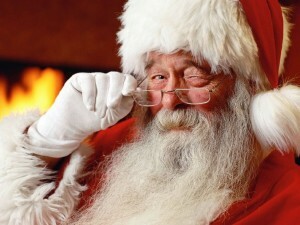 And if you insist on growing a wild beard well into December, let’s just hope your name is Santa Clause.